Hundreds of people lined West Ocean Avenue just outside of Lompoc and Vandenberg Air Force Base on Dec. 3 to witness a historic SpaceX rocket launch. Viewers were greeted with clear skies as the Falcon 9 SpaceX rocket carried 64 different spacecraft from 34 separate organizations as part of the Spaceflight Industries SSO-A: SmallSat Express mission. Based in Seattle, Washington, Spaceflight helps companies like SpaceX identify, book, and manage rideshare launches like the one on Dec. 3. A SpaceX Falcon 9 rocket launches from Vandenberg Air Force Base on Dec. 3. "This mission signifies Spaceflight's first dedicated rideshare mission to a sun synchronous low-Earth orbit and represents our company's effort to accommodate the growing number of domestic, international, government, and commercial customers seeking affordable rideshare options to launch their spacecraft into orbit," a Spaceflight spokesperson stated. The Dec. 3 mission is the largest single "rideshare" from a U.S.-based launch vehicle to date, according to SpaceX. 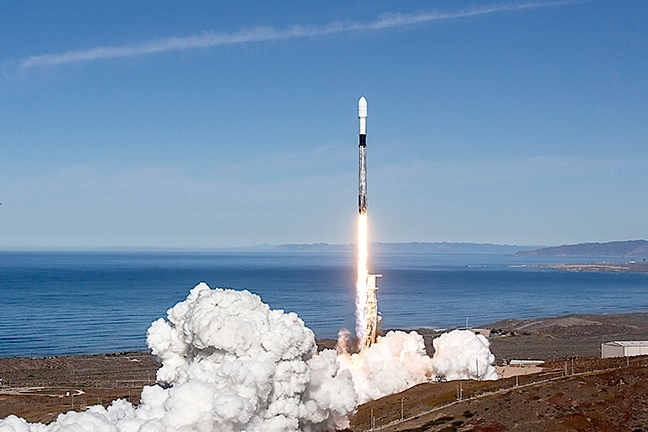 The Falcon 9's cargo featured 15 microsats and 49 cubesats from commercial and government entities, ranging from universities, to startups, to even a middle school. The payloads varied from technology demonstrations and imaging satellites to educational research endeavors and were represented by 17 countries: the U.S., Australia, Italy, Netherlands, Finland, South Korea, Spain, Switzerland, U.K., Germany, Jordan, Kazakhstan, Thailand, Poland, Canada, Brazil, and India. After it released its payload into Earth's orbit, the SpaceX booster was recovered safely in the Pacific Ocean, according to a SpaceX spokesperson.